The Ottery St Mary Choral Society is an active community society, based in Ottery St. Mary in East Devon. Members come from many towns and villages in East Devon to meet every week between September and April. The society usually performs in the magnificent parish church dedicated to St. Mary, from which the town gets its name. There has been a choral society in Ottery since the latter part of the 1800s and records exist showing that, in its present form , the society was founded in 1904. The centenary was celebrated with a special performance of Verdi’s Requiem in the splendid setting of Exeter Cathedral. There has been a concert tour to Ottery’s twin town in Germany, as well as participation in the BBC’s Songs of Praise. 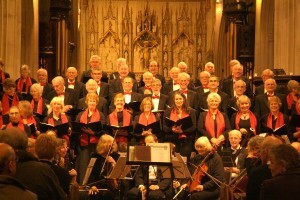 The Ottery Choral Society has performed in all the previous Classics Galore! Concerts in 2007, 2009, 2011,2013 and 2015 and is looking forward to playing an active part in 2017. The Society continues to thrive with an 80-strong choir plus orchestra, which performs two or three concerts a year under the baton of Malcolm Matthews, who has been Musical Director since 1999. The society chairman is David Wade.